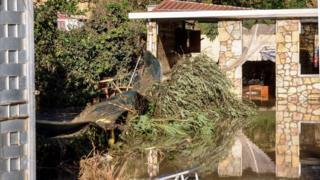 Two families have been wiped out in Italy after a river burst its banks submerging their house in Sicily. Nine people died in the incident in Casteldaccia - from children aged one, three and 15 to their grandparents. Only three people who were outside the house at the time survived. Three other people died when their cars were swept away on the southern island. Days of heavy rain and winds have killed at least 17 other people in Italy, mainly in the north and west. 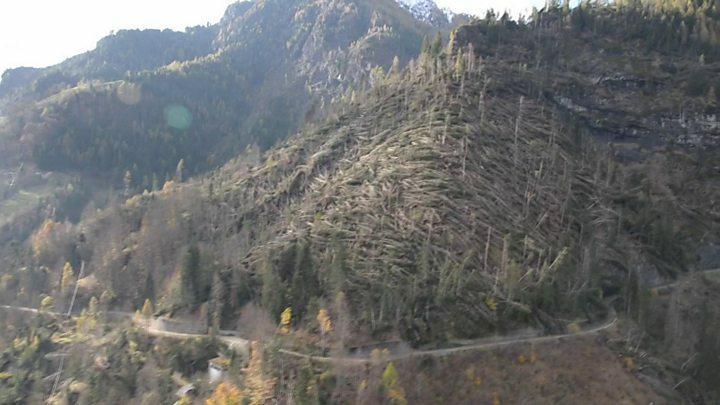 Some of the worst damage was to roads around Belluno in the northern Veneto region, after days of storms had dislodged mud, rocks and water. Six regions remain under alert - from Veneto to Sicily and Sardinia in the south. The tragedy in Casteldaccia occurred overnight on Saturday. Twelve members of two families had gathered to spend the night when water from river Milicia swamped the house. Three of those on the premises had lucky escapes. A father and daughter had gone out on an errand at the time. The third - another father of two - survived by climbing onto a tree. In addition to the three children, the dead included the mother of two of them, her brother, sister and their parents - and the mother of one of the surviving fathers. One of the neighbours described the scene minutes before the incident. "I heard the dogs barking. It was around 22:30 [21:30 GMT]. I told my husband to go out to see what was happening. He opened the door and water filled the house," said Maria Concetta Alfano. Town mayor Giovanni Di Giacinto spoke of a "frightening tragedy" - given the Milicia was only a small river that had never had much water. "It has never presented a threat to Casteldaccia, and it wasn't a very rainy day, anyway," he added. And rescuers are looking for a doctor who was heading into Corleone hospital to start his shift. His car has been found abandoned in a part of the road hit by flooding and landslides.